Aluminum Welded Flat Bottom Jon Boats. Made in British Columbia for the Famous Trout Waters of the BC Interior! Journey Industries has been producing high quality welded aluminum flat bottom jon boats for over 20 years. Made in Kamloops British Columbia for the trophy trout waters of the BC Interior, the Journey fly fishing punts are solid performers and their reputation is impeccable because of it. As far as fully welded aluminum class flat bottom prams go, you simply won’t find a better balance of quality, space, weight and price than Journey Boats. We are happy to be able bring these classic fly fishing machines to your attention. 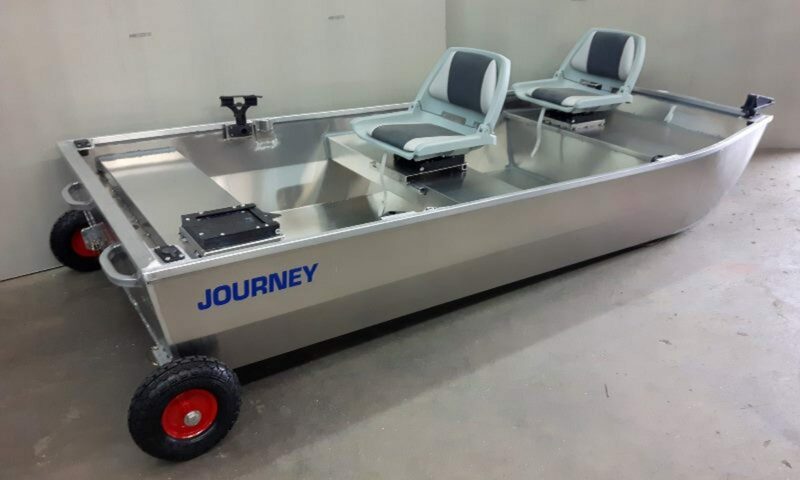 Please check out the Journey Boats features & specifications and accessories pages for more details and do not hesitate to contact us with any questions. Full enjoyed ordering and discussing options with the staff at Journey. Very knowledgeable staff. Fishing boats built by fisherman, can't ask for anything better than that ! … view all reviews in their entirety on the Journey Boats Customer Reviews page. Contact Journey Boats anytime at ……. Copyright © 2018 http://journeyboats.ca. All Rights Reserved.